when i found this photo taken by ms. carol, i smiled. i wonder what prompted this friend to climb up to perch here. did he get a stool? a chair? was this a solo gig? a cooperative game? what is he thinking? how long did he stay there? is he just trying to reach the cash register? how did he get down? i will suggest that too often we as adults instinctively say no. we limit children’s ideas and desires. we don’t trust their intentions and motivations. as a mother of my own three children, i hear myself saying no to them very often. i’m too tired, the house is already too messy, supper needs to be made, etc. i work on this. but at preschool, this is my job. teachers: this is our job. 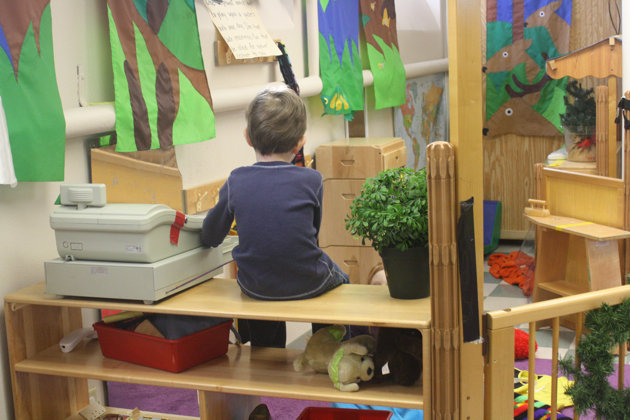 find out why a child is sitting on the shelf. find out why she wants to take her shoes off. find out why he has left his snack on the table but he is looking for a book. 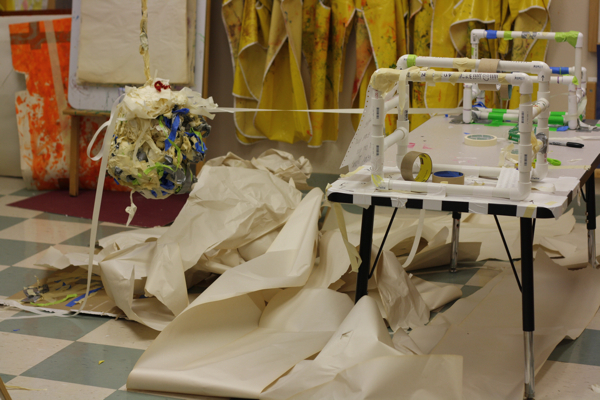 find out why paper is being unrolled all over the floor. find out why the playdoh has been placed all over the doll. find out why and i hope that we can respond, why not? HA HA HA HA HA HAAAAAAAAAAAA!!!!! Wow… you bring me back to why I am in this profession. Thank you for reminding me to say… Why Not!! I just love the red baskets all over the floor, but most of all…I love that you have no lid on the potty, now where is my screwdriver, and I can’t wait for somebody to ask me WHY? I agree. Sometimes just “Tell me about…” can elicit a lot of information. And, if you can begin to get insight into what they are thinking, you can plan for it. I agree completely – and I am now curious as to why the little boy is sitting on the shelf and why there are red baskets all over the bathroom floor!